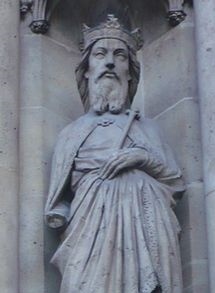 Statue of St. Gontran, Basilica of St. Clotilda, Paris. ST. GONTRAN was the King of Burgundy (present day east-central France) from 561 to 593. Gontran was the second surviving son of King Clotaire, and the grandson of Frankish King Clovis I and St. Clotilda. His brother Charibert reigned at Paris, and Sigebert in Ostrasia. When compelled to take up arms against his ambitious brothers and the Lombards, he made no other use of his victories, under the conduct of a brave general called Mommol, than to give peace to his dominions. The crimes in which the barbarous manners of his nation involved him, he effaced by tears of repentance. The prosperity of his reign, both in peace and war, refutes the proposition that human policy cannot be modeled by the maxims of the Gospel. In fact nothing can render a government more flourishing. King Gontran always treated the pastors of the Church with respect and veneration. He was the protector of the oppressed, and the tender parent of his subjects. He gave the greatest attention to the care of the sick. He fasted, prayed, wept, and offered himself to God night and day as a victim ready to be sacrificed on the altar of divine justice, to avert God’s indignation which he believed he himself had provoked and drawn down upon his innocent people. With severity he punished crimes committed by his officers and others; and, by many wholesome regulations, restrained the barbarous licentiousness of his troops. But no man was more ready to forgive offenses against his own person. With royal magnificence he built and endowed many churches and monasteries. This good king died on the 23rd of March in 593, in the sixty-eighth year of his age, having reigned thirty-one years and some months.